One of Whitby Town’s longest-serving and most consistent performers has decided to join the Blues’ EvoStik League rivals Darlington 1883. Centre half Kev Burgess has been a fans’ favourite since he signed for Whitby Town in 2008 – ironically from Darlington – before the club went bust and reformed. But now Burgess, 27, has told the Blues he is moving on to the County Durham oufit, who won promotion into the league’s Premier Division via the play-offs. Burgess rejoins former Town team-mates Graeme Armstrong and Tom Portas, who both quit the Turnbull for Darlo a year ago. Boss Darren Williams told the Whitby Gazette this week the cash-strapped Blues are finding it harder to compete with some of the wealthier non-league clubs. “I’m frustrated because we have a vision of where we want to go but part and parcel of that is due to finances as well,” he said. “From our point of view, people putting money into the club, ie crowds, make a big difference and we’re aware of Darlington’s fanbase, which is good. “We’re fighting a very volatile market and it is hard to compete. “It was Kev’s decision to leave. “He’s been at the club a long time and it was an opportunity to change and go on to something new that’s not the same season after season. 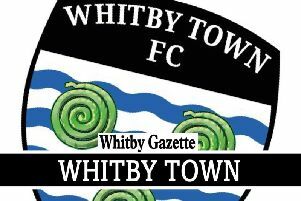 Williams said Burgess, who has made 276 appearance for Whitby and scored 12 times, will be a big loss. “I’ve not a bad word to say about Kev since I’ve been at the club – he’s been fantastic,” said Williams. “He was injured most of last season which didn’t help but he’s a great lad to work with and committed fully, and shows that in every game he plays in. “We didn’t have him for a lot of last season because of an Achilles problem and lost him again towards the end, pulling a hamstring at Nantwich. “If you lose any key player, it tends to be a tough season. With an attractive pre-season schedule ahead – including home games against Darlington, FC United of Manchester and League Two side Hartlepool United – Williams is hoping to attract new faces to Whitby. “We’re pushing on trying to get players in. “Everyone will be saying ‘Kev’s gone, who’s next?’ and that’s not what we want – we’re trying to build something.